Tucked away deep inside Bandra-Kurla Complex (BKC), Mumbai’s newest business district, and overlooking the dirty waters of Mithi River, Signature Island doesn’t really sound like a posh address. But that has not stopped the Maximum City’s well-heeled from shelling out Rs. 25 crore or more for an apartment double the size of a basketball court. Further down the vehicle-deluged Western Express Highway, an 80-acre plot in the filmi neighbourhood of Goregaon will soon host three residential towers packed with amenities that even the richest in Mumbai couldn’t have dreamt of a few years ago. A skating rink in this sweaty, hot city is par for the course. At first glance, these properties defy logic. Homes this expansive are more the exception than the norm in this space-starved city where owning a 600 sq. ft. house makes you feel like a king. Location is held at a premium, not the living space. A tiny shack in the city’s south could command several crores of rupees. Even after the property market expanded to the suburbs over the last five years — when builders like Hiranandani and Raheja sold hundreds of middle-class homes — the average size of a Mumbai flat hasn’t crossed 1,000 sq. ft. So, apartments seven or ten times the size, away from the traditional uptown are a new phenomenon. But a new generation of real estate mavens believes that is the way to go. Ask Kamal Khetan, a first-generation realtor, Vikas Oberoi, the young head honcho of Oberoi Constructions and Abhisheck Lodha, managing director of Lodha Developers, and they say the strategy has already begun to work. They are getting young and prosperous nuclear families to go in for more spacious and luxurious living quarters. The farther the couples move out, the bigger their homes will be. It helps that the market itself is shifting towards larger apartments. 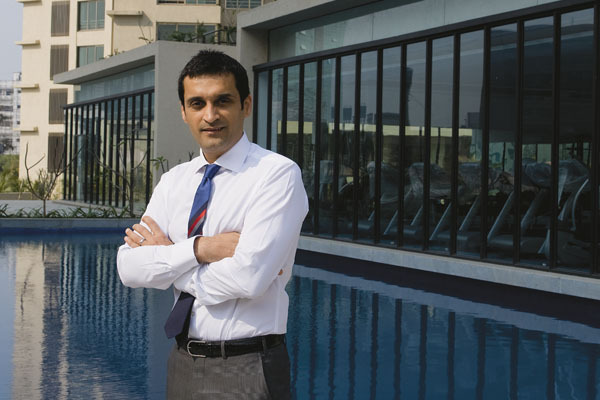 “There is a pent up demand for bigger homes in Mumbai and this is still the early wave of upgrades,” says Oberoi. He and Lodha are targeting double-income families that earn over Rs. 30 lakh a year. The number of households in Mumbai is expected to rise from 42 lakh in 2008 to 66 lakh in 2020. People earning above Rs. 20 lakh will increase from 4 percent to 10 percent during the period. That’s 660,000 families. The next level, earning in the range of Rs. 10 – 20 lakh, will sharply increase from 4 percent to 15 percent. Lodha says that there is a good business plan in just focussing on the top two brackets. While the opportunity clearly exists, it will not be easy for these builders to pull off this trick. Because of high investment interest, Mumbai real estate can be volatile and one bad land deal could sink a company. In a downturn, these ultra-luxury homes will be the first to be hit. Dropping prices could make such high-cost projects unviable. Also, Mumbai has several developers who can scale up and offer similar apartments. Raheja is already building large condominiums, while a relatively new developer, Dosti, has gained success by creating a township within the heart of the city. In short, the segment will soon see fierce competition. Three factors are driving the builders and affluent buyers to the suburbs. The floor space index, which measures the size of construction allowed relative to the land size, is twice as much in suburbs as in the old city. Second, decades-old housing laws stipulate paltry rents in the city, where it is nearly impossible to evict tenants. Third, the land supply comes in a trickle while migrants are pouring in. “It is this long-term short supply of land that is keeping the demand high,” say Anshuman Magazine, chairman and managing director of Delhi-based real estate consultancy firm C.B. Richard Ellis. In fact, India’s richest man, Mukesh Ambani, shares a modest apartment (in comparison to his wealth) with his wife and three children in the family’s skyscraper Sea Wind in Colaba. Only recently did he begin building a villa in the sky with an estimated space of half-a-million sq. ft, in South Mumbai. Oberoi, Lodha and Khetan’s Sunteck Reality are betting that Mumbaikars with much lesser riches will also upscale and demand larger homes, just like in smaller cities. The niche business is attracting attention for another reason. While India’s largest real estate companies are two Delhi-based companies (DLF and Unitech), a spate of initial public offerings are on the anvil from Mumbai-based ones. Companies like D.B. Realty, Oberoi Constructions and Lodha have over two million sq. ft. worth of projects each. As they command a premium over their competitors, investors have begun to take notice. Sunteck’s stock is valued much higher than its competition — largely because of its exclusive business focus. As the market matures, the legacy of grey market deals — euphemistically called cash transactions — is going away. Unlike a few years ago, it is now possible to keep a property deal above board. Private and public equity is coming into Mumbai real estate, making it more professional. Companies like Oberoi and Lodha are all looking to list their shares and use their valuations to raise capital from public markets. Another city firm, D.B. Realty, is looking to raise Rs. 1,500 crore to fund high-end housing projects. Khetan’s Sunteck raised Rs. 500 crore from institutional investors in September. A bad financial track record is something they can ill afford. 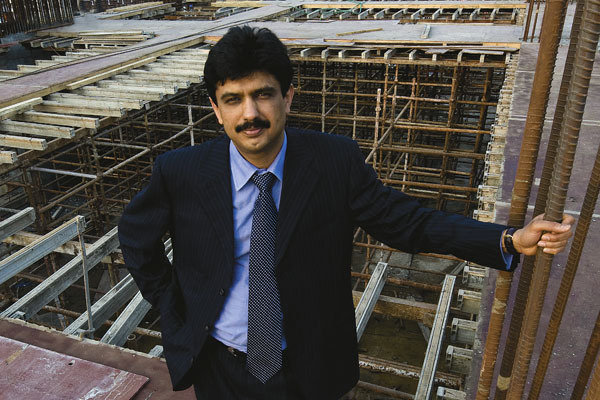 “A few like Lodha and Oberoi are slowly trying to bring the best practices in selling and servicing that sets them up in a different light,” says S. Sriniwasan, CEO, Kotak Realty Fund. But stock valuations are only the beginning. The realtors will need a winning game plan to stay and succeed in the market. And that’s what Khetan, Oberoi and Lodha are attempting to do by adopting strategies far different from the established players. Until three years ago, Khetan was not even in the property business. He began modestly by leasing a couple of floors in BKC. Then, he took a daring bet to bid for a piece of land in the same area in 2007. Paying just Rs. 7 crore and borrowing for the rest, Khetan got 1.7 acres of land in a corner of BKC, away from the bustle of banks and financial institutions. Against all conventional wisdom, he decided to build an ultra-luxury residential complex. His reasons? Two big schools, the American Consulate and the airport are nearby. But he needed to differentiate his homes strongly. That is when he decided to build apartments that are as big as private bungalows measuring 7,000 – 11,000 sq. ft. with all the creature comforts. Khetan says the pace of booking has been so good that he won’t have to borrow further to complete the project. Along the way Khetan took some calculated risks. Sunteck won the BKC plot against competition from the likes of Raheja and Naman. Sunteck’s bid was the highest, but Managing Director Khetan figured he could recover it by charging a 20 percent premium over the rates for commercial property. On the other hand, he also knew when not to spend. He conserved the Rs. 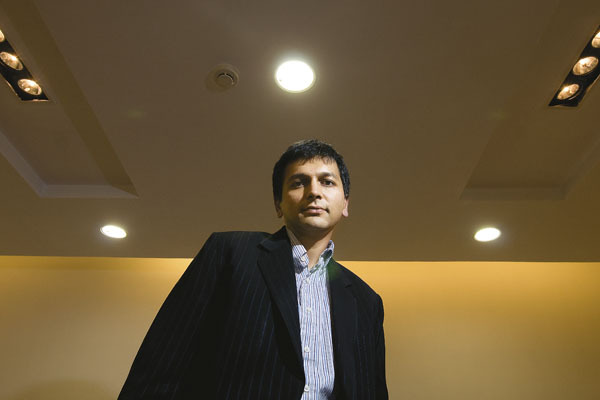 500 crore he raised through private equity when he thought the market was over-heated. Focussing on ultra-rich homes has required a business model that’s different from the rest of the pack. For starters, Sunteck hardly holds any land back on its balance sheet. Says Managing Director Khetan: “Unproductive inventory of land is as bad as any other stock. If we don’t have a finite schedule to develop a property, we won’t hoard that land in our balance sheet.” This asset-light model enables him to pump in all his money into the high-cost construction and marketing. Perhaps the one exception he has made is the purchase of two plots in Airoli, Navi Mumbai, in an auction conducted by the land agency, CIDCO. It was done through Piramal Sunteck, a subsidiary. Khetan says this was a one-off land deal justified by the premium he could charge in that location. On their part, Lodha and Oberoi burst into the scene when they picked up real estate that is not easy to come by in Mumbai. At one stroke, Oberoi got 80 acres of land that had been pharmaceutical company Hindustan Ciba Geigy’s research centre in Goregaon. Lodha was among the earliest to acquire mill land within the city — the defunct Apollo Mills. hunting for similar large properties that can hold his mega opulent colonies. He had earlier bought an entertainment park in Jogeshwari, a suburb close to Goregaon, before bringing it down to build luxury apartments. “We want to concentrate on large spaces and in the suburbs where the action is,” he says. Lodha popularised the “by invitation” sale of its premium apartments at Bellissimo, on Apollo Mills land in central Mumbai. The skyscraper is being sought after for the exclusivity of its facilities and the large space on which its stands. “There are new buyers in the market who have not lived or experienced the flats in Mumbai and are more than willing to pay extra for what is considered common amenities elsewhere,” Abhisheck Lodha says. But Lodha doesn’t confine itself to the super league. It has a diverse land bank and is constructing a variety of houses across Mumbai. It is building a complex at Dombivili in the outreaches of Mumbai, which by any standards will not qualify for a luxury location. Another old name, Kalpataru Builders, has built several upscale apartments within the city, buying land from older industrial estates and factories. But the new age builders would offer superior sales and service standards to stay in the game. Hi I am actively looking to short idiotic Indian banks. If you can publish articles on some of the dumb people lending money to these guys the writer might get a small treat from a grateful investor. Ideally it should be about Indian banks and how much their real estate exposure is. Fun fact: a 1 % rise in floating loan interest rate in the first year can increase your EMI by 20-30% assuming you have a 10 year 10% 10 lakh home loan. Finally! People will get some real value for money in real estate in Mumbai. Do note though that this is a rather well executed strategy by the real estate "mafia" to milk the well to do customers. First they sold very basic apartments at exorbitant prices and no real value apart from the four walls in return; and when a threshold is reached and the customer seems to be not buying into the same they have now launched these "luxurious apartments" with "new age amenities" at new levels of premium which btw should have been offered at the initial levels already!Well disguised i say!